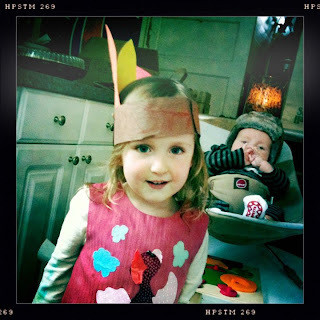 Hola Lola: Gobble! Gobble! Gobble! For the first time since we lived in NYC, we were home on Thanksgiving Day. We got up early and successfully completed the Turkey Trot. We walked there and back so we technically walked about 7 miles when it was all said and done....felt great! We had a blast and I would love to make this a tradition but probably will be hard as we typically won't be home on Thanksgiving Day. Lots of people! I think they were expecting between 15 - 18,000. I think Clay's "jogging" shoes could possibly be considered vintage at this point. Not even kidding. I believe this shoe is from 1995 or 1996. They're still going! We spent the rest of Thanksgiving day with friends- Kristen & Kevin, Soumya & Jesse and Erika & Keith. We had such a wonderful time! Nothing like good friends, good company, good food and good memories! The cold front came through but it was actually nice. We had our Thanksgiving meal out on our covered patio. As usual, the kids were great! Gaines made a perfect table decoration there at the end....better than a cornucopia! Lola helped keep a smile on every ones face throughout the evening with her sweet/fun-loving personality! Gainesy's winter attire is not so good at this point. OBVIOUSLY, need to invest in some gloves (those are socks on his hands in the pic) and maybe even a coat. Wasn't quite ready for the "cold" front. Thankfully he has plenty of baby fat and rolls to keep him warm. We had a hat though...LOVE IT! Ironically, his hat kind of looks like his Daddy's hair. The next morning we got up and head down to my parents ranch to spend the weekend with my family. There, we had more great food and great company! It's always fun to get the cousins together to play. There's nothing like watching them all grow up together. Next weekend we'll head back to Dallas for Curry's 1st Birthday! I can hardly believe it....it seems she was just born. Here are the adorable girls! We also ventured off on a "safari" in Glen Rose on Saturday. It was entertainment for all! 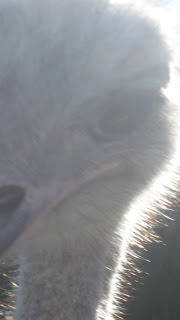 Especially when the ostrich stuck his head in the car nearly causing Clay to have a heart attack. He still managed to snap a picture of the big guy as he was coming in the car...impressive! By the time we got to the halfway point, it was time to bust out the adult beverages as this was a very long safari. It was still a blast and Lola loved feeding the animals! I look forward to continue the holiday fun! We'll pick out our Christmas tree this week and start getting all our Christmas decorations and lights up. Only 28 days until Christmas. I also hope to take the kids to see Santa either this week or next. Lola is biting at the bit to go see him asap! She's now saying she won't cry....that is yet to be determined!